Experts at Embibe will provide KCET Answer Key along with detailed solutions of KCET 2019 right after the exam. Remember to watch this space (bookmark this page for your convenience) so you can download KCET Answer Key by Embibe along with KCET question paper and solutions for all sets. Calculate your KCET score and get to know your rank within a few hours after writing the exam! Additionally, you will also get answer keys released by other coaching institutes for comparison with Embibe’s KCET Answer Key. How To Download KCET Answer Key 2019? 1st Step: Visit the official website of KEA: kea.kar.nic.in. 2nd Step: Click on the link provided to download the KCET answer key 2019. 3rd Step: You will see separate links to download KCET answer key for each subject. Click on them and download your KCET 2019 answer key. How To Calculate Your KCET Score Using KCET Answer Key 2019? KCET Paper 1 has 60 questions each carrying 1 mark. There is no negative marking in KCET. So, your KCET score will be equal to the total number of correct responses in Physics, Chemistry, and Maths. How To Challenge KCET Answer Key 2019? As mentioned above, candidates will be able to challenge the provisional answer key released by KEA. If the authorities find the objections to e valid, they will rectify the mistakes and publish the final answer key. Based on the final answer key of KCET 2019, KEA will release the KCET result 2019. Candidates will have to challenge the answer key by sending an email to the official authority. The email should include all the necessary information regarding the question (s) against which the objection is raised – paper code, subject, question number, etc. Candidates should include the documents supporting their claims in the mail. The email is to be sent to keauthority-ka@nic.in. The KCET previous year official answer key are as under. These will help KCET 2019 aspirants in their preparation when they solve KCET previous year papers. 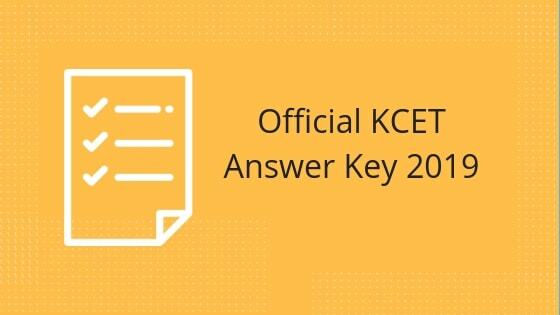 So, now you are aware of all the necessary information regarding KCET Answer Key 2019. Focus on your preparation and make the best use of the remaining time. Give your best shot to get into one of the best engineering colleges in Karnataka. Since the KCET syllabus is almost the same as the syllabus of other engineering entrance exams like JEE Main, solving JEE Main practice questions is recommended. These are available for free on Embibe. You can also take free KCET mock tests on Embibe. If you make the best use of these materials, you will definitely crack KCET 2019. We hope this detailed article on KCET answer key 2019 helps you. If you have any question regarding this article, ask them below and we will get back to you at the earliest. Embibe wishes you all the best!